We can’t believe this will be Rawling’s 4th year of the Quatro. 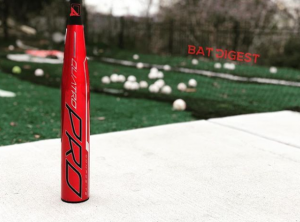 We took the 2020 USA Quatro to the field for some hitting as well as discussed the major changes in the bat with Rawlings directly. That information, as well as the information we measured, comprises this 2020 Rawlings Quatro Pro Review. Our hitters liked the big barrel, length afforded by the drop 12 and the sound of the new 2020 Rawlings Quatro PRO USA Bat. The Lizard Skin Grip, looks and barrel size were helpful too. We aren’t the only ones to have information about the Quatro Pro. Other places, in particular those who sell bats, usually have a boiler plate write up on the specs of a bat. Many of those we reference to make sure we are seeing what we should be. Here are some more references for the 2020 Rawlings Quatro Pro review. The barrel is massive on the USA versions of the bat. (We’ve yet to see the USSSA or BBCOR versions of the 2020 Quatro Pro). The drop 12 gives is a remarkably light swing and, by our measurements, it is the largest barrel per swing weight on the market. It reminds us of the old Combat barrels. Those who need more length due to weight restrictions should really like the drop 10 type feel this drop 12 bat has. If you are looking for the premier bat in the drop 12 USA space then the Rawlings Quatro Pro should be right in your wheel house. Expect a real smooth smash even on bad hits as well as a huge barrel and ultra light swing weight. In terms of a drop 12 USA Quatro Pro the 2020 version stands alone. 2019 didn't product a drop 12 USA Quatro. Expect a BBCOR and USSSA version of the 2020 Quatro Pro closer to September of 2019. If the upgrades in the USA version hold over to the USSSA version you should expect a much bigger barrel and the Lizard Skin grip. The larger barrel is created by the use of multiple smaller discs in the barrel versus the one longer one they used in the 2019 and 2019 versions. Discs in barrels is not a new thing and something many fastpitch bats have been doing for years. We are hopeful, considering its our favorite, they keep the BBCOR bat much the same. In terms of a drop 12 two piece composite you won’t find another bat in the USA space. There are not any. However, there are some drop 12’s but those are single piece bats. Look for something like the Rawlings Threat or Easton Hyperlite. In the BBCOR, USSSA and USA non drop 12 space you can find a lot of similar bats. We like the CF Zen series from DeMarini and the Ghost Evolution series from Easton. Of course Slugger’s 919 and Meta series play well too. After hitting with the 919 Prime from Slugger in four games and several hundred hits in the cage, among a few different players, this is our 2019 Louisville Slugger 919 Prime Review. Generally, the bat feels much like it did last year. The Quatro Pro USA Bat uses multiple composite discs in the barrel to help expand the sweet spot and expand the durability. This is an upgrade compared to last year’s model which used a single disc. At release (April 1st, 2019) the 2020 Quatro Pro comes in a drop 12 USA Bat only. However, we fully expect it to come in a full line by September of 2019. That is, expect multiple drops in both USA and USSSA as well as a BBCOR version too. We’ll update this page when we learn more about that.